Author: Seidensticker, Edward Set In . . . There can be few cities in the world that live, pulsate, and breathe through their geography as Tokyo does, few cities with a history that shifts through the creases of space as does that of Tokyo. This is particularly ironic in a city whose neighborhoods today hold few distinctive features and whose gentle topography has been all but obscured by batteries of building. But it was not always so, and what better way is there of writing Tokyo's history than by reflecting this shifting geography as neighborhoods prospered and declined while others, more aspirational, climbed up the socio–spacial ladder? 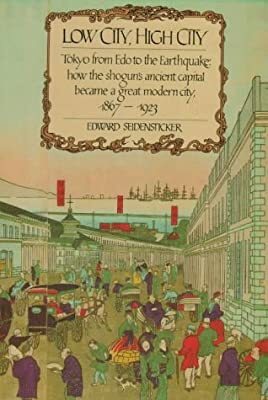 This is precisely what Edward Seidensticker does in the pages of these books, brought together here together for the first time under one cover with numerous illustrations and an insert of beautifully colored Japanese woodblock prints of Tokyo from the era. Tokyo: From Edo to Showa tells the story and history of Tokyo's transformation from the Shogun's capital in an isolated Japan to one of the most renowned modern cities in the world. With the same scholarship and style that won him admiration as one of the premier translators of Japanese literature, Seidensticker offers the reader his own brilliant picture of a whole society suddenly emerging into the modern world. By turns elegiac and funny, reflective and crisp, Tokyo: From Edo to Showa is an important cultural history of Asia's greatest city.